At a hearing on recovery efforts after natural disasters in 2017, lawmakers call for spending more money and resources before future disasters strike. 2017 was an especially damaging year for severe weather. Atlantic hurricanes and western wildfires displaced entire communities and stretched emergency agencies thin. Now, Congress is learning lessons that are already helping in 2018. "It is critical we do what we can to help communities rebuild smarter and better," said U.S. Rep. Lou Barletta at a recent hearing on recovering from the natural disasters of 2017. Emergency planners call this mitigation. The idea is that if disasters force communities to rebuild, they should do so in a way that minimizes future risks to life and property. This can mean moving buildings to higher ground to reduce flooding from hurricanes, building stronger wind-resistant roofs, or clearing natural fuel sources from around homes so wildfires can't get too close. And when disaster inevitably strikes, better preparation will go a long way. 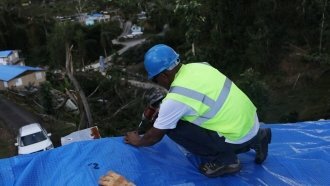 FEMA says it learned lessons in Puerto Rico about just how important it is to have enough resources ready. "Where we had one warehouse going into 2017, we have five on the island now," said Jeffrey Byard, associate administrator for the Office of Response and Recovery at the Federal Emergency Management Agency. "Where we had thousands of commodities, maybe in water and MREs, we have millions now." This mitigation and preparation can be expensive, but it still might be cheaper to be ready for a disaster than to have to rebuild. For example: In 2017, FEMA earmarked $90 million for pre-disaster mitigation in the U.S. — and wound up setting aside $1 billion just for Texas after Hurricane Harvey. Emergency planners say in the long run, funding disaster preparedness efforts tends to save both resources and lives. Every dollar spent on mitigation avoids as much as $8 in damage during a natural disaster.